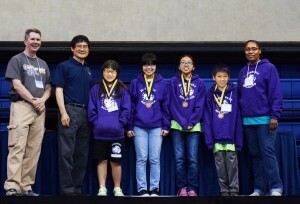 At the 2015 C-STEM Day a team from Roosevelt Middle School in Oakland Unified School District participated for the first time in the C-STEM Day RoboPlay Challenge Competition. Nearly 90% of students in the school are in a free or reduced-price lunch program, and the school population consists of a large number of English Language Learners. As the RoboPlay Challenge is a level-playing field robot competition, regardless of students’ social-economic status or background, any team has the opportunity to succeed. With strong support from Principal Cliff Hong, the school has now fully embraced the C-STEM program and is providing computer science education through the C-STEM curriculum for all students.